Functional plasticity in a plant’s hydraulic architecture may constitute a mechanistic basis for anticipating the differential success of plant species in response to climate variability. von Arx et al. 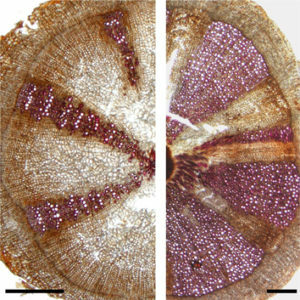 compare several lifetime functional traits in the root xylem of the long-lived perennial herb Potentilla diversifolia (Rosaceae) growing in a 14-year water supplement experiment, and find that plants receiving additional water show a shift towards wider vessels, greater hydraulic conductivity, reductions in starch storage capacity and increased specific leaf area. These phenotypic changes represent consistent, dynamic responses to increased water availability that should increase plant competitive ability.